Yesterday, I finally managed to clip Flurry. I rode him in the arena first thing in the morning – he was lovely! 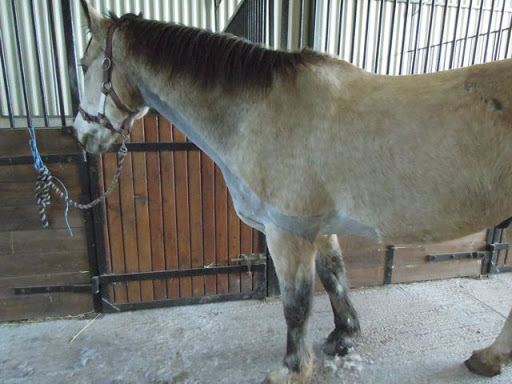 We worked on canter a little bit, so he had sweated up a lot by the time I finished. I washed him down well and then worked with Aero. By the time I finished, Flurry was drying out well, so I decided to come back to the farm with my clippers straight after lunch and pray that he wouldn’t roll again. 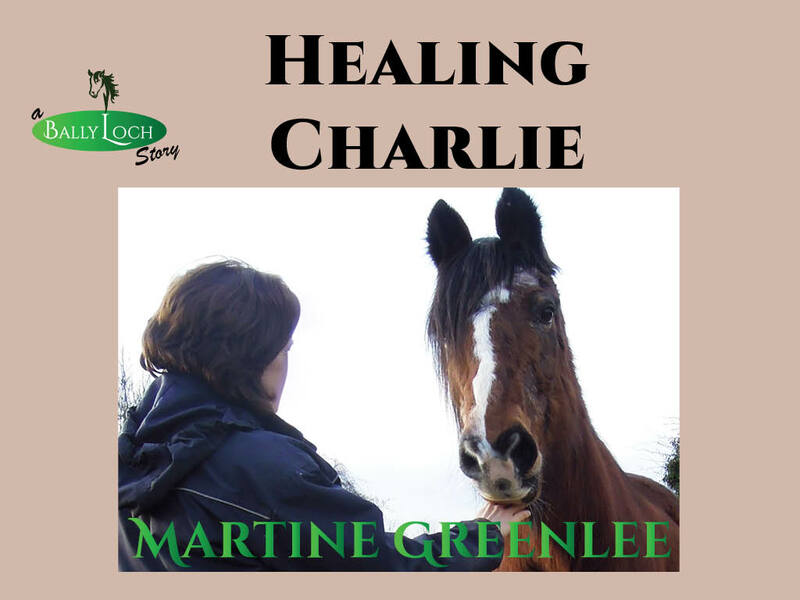 I arrived back to a clean horse – what a miracle – so I brought him down to the stables and got to work. Two of the other liveries were there, I think they are mother and daughter. They own a grey mare and her eighteen month old son, who is a very handsome boy indeed. I’ll do a post soon about the farm and all the horses, and you’ll see what I mean. I had met the Mum and Daughter before, but, apart from the “Bonjour” required by politeness, they’ve pretty much ignored me – I am the outsider here, after all! This time, though, they were doing some in-hand work with the foal, and came down to the stables. They wanted to introduce him to puddles – a rarity here – and also let him see a clippers in action. I had a good chat with the mum, whose name, strangely enough, is Martine. Horses are a great common ground, and once we got going, we found we had a shared passion for good Dressage – it seems DuJardin, Hester and Munoz Diaz translate into every language! We ended up with the daughter helping me finish off Flurry’s clip, by pulling his front legs forward to so I could clip his “underarms,” and also with a promise of hacking companionship – she is getting a Connemara pony to ride for the winter months, and will be delighted to have someone to ride with. Alexandrine’s mother Marie-Christine then arrived, to accompany Alexandrine the first time she rode a young horse out. More chatting ensued, as she tacked up her horse, Pietro. She told me that Pietro is supposed to be a Criollo, but doesn’t have any papers. She’s only had him since last January, she bought him when her old horse had to be retired. On his feet, he wore Renegade boots – her old horse was barefoot for seventeen years and Pietro is making the transition to barefoot. She does her own trimming, but gets the farrier to check her horse every eight weeks or so. She rides in a rope halter – Alexandrine helped her train Pietro to be rideable in a halter instead of a bridle when he arrived last January. 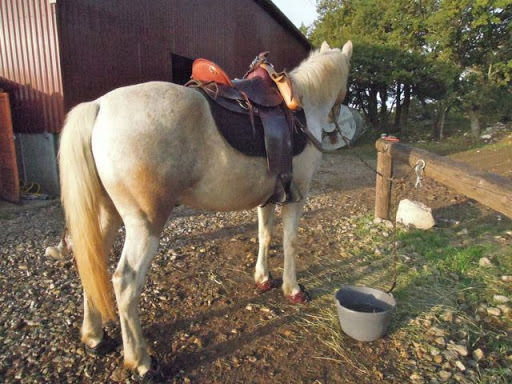 On his back, was a western type saddle, with a bridle slung over the horn – just in case she needed extra control if Alexandrine’s youngster was difficult. Also slung over the horn was a leather case, containing a large pair of snips and a foldable saw – she told me that, as she rides along the local trails, she cuts down any low branches and helps to keep the trail clear for everyone. I also noticed that she was wearing a helmet – I was a little surprised, actually, that’s quite un-French. I remarked on it and she said she always wears one, and I nodded, I always wear one too. 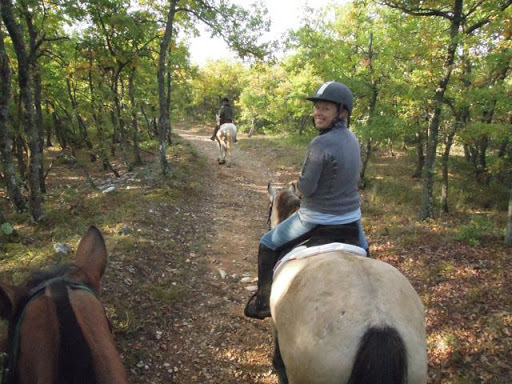 I ended up thinking, this lady is a serious horsewoman, she’s a wee bit older than me but is not only still riding (a lot), she’s doing her own horse’s feet & she works on keeping the trails clear for the benefit of others. I was finding it hard to keep up with the four-way chat and my brain was rapidly approaching meltdown, so I politely excused myself and took Flurry back to his field. But before I left, Marie-Christine made a hacking “date” with me for the following morning! Brilliant! Someone local to show me around! I was really looking forward to our trek the following morning. I decided that I would ride Flurry, so I could just relax and enjoy myself – Aero is still a little unsettled and would be something of an unknown quantity (to me) with strange horses. Marie-Christine watched me tack up and asked if I used the Renegades on Flurry. When I said no, she nodded and said his feet looked good (go, Flurry’s feet!!). “I think I’m in the perfect place” was my reply, as we set off down the drive. The hack itself was perfect, uneventful. The young filly settled quickly and Alexandrine mounted. We were on the road for about 50 meters at the start and at the end, otherwise we were on woodland trails and forestry roads. Idyllic. 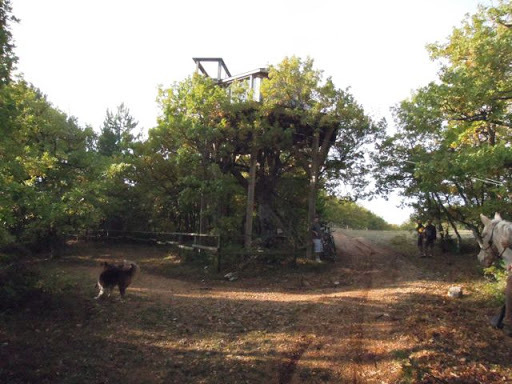 In the middle of the woods was this very cool tree-house, where we met some bikers who had stopped for a break. Alexandrine offered to take a photo of me, which was very nice of her, so here I am grinning like an idiot over my shoulder. Alexandrine’s youngster is a Lusitano, so her mane and the top of her tail have been clipped. She’s just with Alexandrine for breaking, and will be going home in about two weeks. After about an hour, Marie-Christine asked if Flurry would be ok to give the filly a lead home. Sure, I said, so she bid us farewell and headed back towards Reillanne where she lives, but not before she offered to meet up with me again to show me around some more – yippee! Alexandrine and I were continuing through the woods when we came to a cleared area, where there was someone with a tractor and trailer, loading logs. “C’est mon Papa,” said Alexandrine (that’s my father). OH!! Does he sell wood? We need to buy some for the winter! was my very enthusiastic response. It turns out he does, so we stopped for a chat and I got my order for winter firewood sorted out. HAH! That’s one Dreaded Foreign Fonecall I won’t have to make! To finish the morning, I got a spin on the Quad with Alexandrine, just from the horses’ field shelter back to the stables. I’ve never been on one before, what fun! To end a great day, our first visitor arrived. Granny is here for the next two weeks. She had an uneventful flight from Dublin to Nice but is a bit tired – currently snoozing in the armchair beside me. All in all, it’s been a really good couple of days and I’m beginning to feel like I will fit in well at the farm. I’m determined to keep speaking my crap French. Marie-Christine offered to speak English, which was very kind, but I said no, I have to learn. They were both correcting me as we rode along, which I appreciate, I just hope I can retain some of their corrections, otherwise they will start to think I’m some sort of a dunce! Later on that day, I met Georges, Alexandrine’s Papa, and we chatted for a bit – he was speaking very slowly and clearly, and offered words if I was stuck. They are all being so kind, and I really appreciate it. I’m looking forward to seeing what the next few weeks bring. Merci, SL, j'aime la vie ici! Hi Martine,What an enjoyable post to read. Interesting to see how similar you and your new friends are regarding horses. 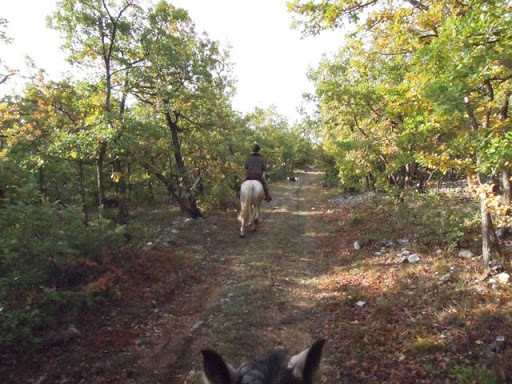 And … such a beautiful ride! It's been a long while, but I'll give it a try: Profitez de la vie en France. They're not all barefoot but Marie-Christine is pretty passionate about it! The local trails are amazing, the farm is in the middle of woodland with trails going everywhere. Oh you are settling in well. Fellow barefooters too, very enouraging. Love the look of your local trail. Thanks, GHM, hoping it all keeps going well and I don't end up making some awful lingual faux pas and insulting someone! It's great that you are making friends at the stable. I admire your determination to speak French, I don't think I could learn a new language at this stage of the game. Your ride looks beautiful and it looks like you do fit in and will have lots of fun with this group of people. Nice to hear you are blending in well…..regards to all. Do you rug your guys in the winter, Annette? Mine would both be rugged by now if we were at home, but I am hoping to keep them un-rugged here – it worked for us last year, but that was a very dry (and cold) winter. Flurry's clip is what we call a Bib Clip at home but the Franch call it a Tablier (Thanks, Helen Barnes!) – just the chest and back as far as the girth line. Last year I clipped his jaw and up behind his ears too, but at the moment I wanted to go for the minimum needed to make him a bit more comfortable.Re French – I was good at it in school and my teacher wanted me to try to keep it up afterwards – I was doing a computer science degree, but she urged me to got the Alliance Française in Dublin. Guess who's sorry now!!! Thanks, Jo, hope you're keeping well. What a wonderful post. I like the trace clip you gave Flurry. I plan to give Winston a trace clip as well. I like our horses to keep as much winter coat as possible while still allowing them to not sweat too much with work and dry quickly. Your ride sounds wonderful, so pretty!I'm laughing with you on the French language thing. I try to speak French when ever I am in France and so appreciate understanding helpful, lentement, speakers. When we were at the Alisal last week, I got a pedicure. The lovely young woman doing my nails said to me "I'm from France" and I tried to talk to her in French but she had such a hard time with my accent, and I got frustrated not being understood… so I just gave up. She was kind, but clearly couldn't make heads or tails out of my French. …so I empathize with that part of your transition. Great to see your settling in so well. Thanks, Camryn (and welcome) yeah it's difficult, and it was difficult leaving so many friends behind, but this is what we want to do. It will only work if we make it work, if you know what I mean, it's not going to just happen by itself. So happy that you're finding friends. Can only imagine how difficult it must be.